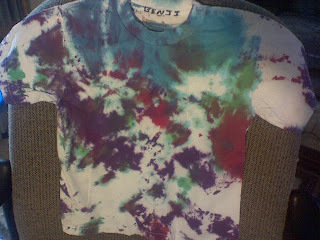 This is Benji's tshirt that he tie dyed last week at school. They did it on Wednesday and he wore his blue camo tshirt with Cars stickers. I think he did a wonderful job! They used the spray dye which can be hard for Benj given the hypotonia. His hands tend to tire. The shirt is cute and he is very proud of it... his "paint shirt". He is very proud of himself with this shirt. And momma is very proud of him.